£5 pay as you go, no need to book, just turn up. No need to bring a mat as we do not exercise on the floor. 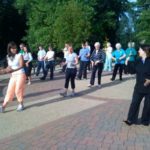 Tai Chi Qigong relaxation and well-being class for everyone. Those who are new to Tai Chi Qigong are very welcome.